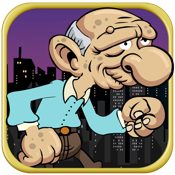 In this hilarious game, you're a crazy old grandpa that just escaped from an "old folks" home! Run and jump your way to freedom as you try to avoid numerous obstacles. - Fun easy game play. - Will keep you entertained for hours!